Numeen is an Argonian commoner living in Leyawiin with her rascal of a husband, Mahei, who seems to spend most of his time hiding from her. They are both regular guests of the Countess, however, so they are occasionally able to tolerate each other. Numeen's day begins at 6am when she wakes up and wanders around her home -occasionally conversing with her husband- until midday, when she goes to the Three Sisters' Inn for breakfast. Once Numeen arrives she takes an hour to eat, and then wanders around the inn. She leaves at 6pm to go home and eat a long dinner with her husband until 10pm, and then wanders around her home, finally retiring to bed at 1am. Numeen wears a set of upper class clothing consisting of a black & burgundy outfit and a pair of blue suede shoes. She carries her house key and a large amount of gold. Mahei and Numeen are also known as the Derics; the key to their house is called the Derics' Key, and there are two rumors that refer to their constant bickering: "Have you heard the Derics arguing?" and "Have you seen the Derics recently? They're always bickering with one another." Numeen introduces herself by referring to the difficult relationship with her husband: "My name is Numeen. Have you seen that no-good rascal husband of mine, Mahei? Gods know what he is up to this time..." and brings it up again when asked about the city, "Gods are my witness! I give that man the simplest list of things to do, and somehow he forgets half of it and gets the rest wrong." It is likely that Mahei and Numeen were originally Bretons. 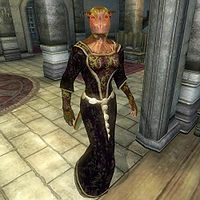 Almost no Argonians have a surname, and "Deric" is similar to other Breton family names (Liric, Maric, Meric, Aric, Fransoric, and Jenseric can be found in Morrowind and Oblivion). This would also explain Countess Alessia Caro's habit of dropping in to see them despite her racist dislike of Argonians. Esta página foi modificada pela última vez à(s) 22h11min de 12 de dezembro de 2015.